Put on Batgirl's utility belt and unleash your power! It's easy to find your inner hero with this roleplay set inspired by Batgirl, a favorite student of DC Super Hero High. The crazy smart, totally cool techno wizard has a ton of fun gadgets to immerse yourself in Super Hero play. Put the yellow utility belt on to begin - 6 snaps and holes ensure a wide range of fits. 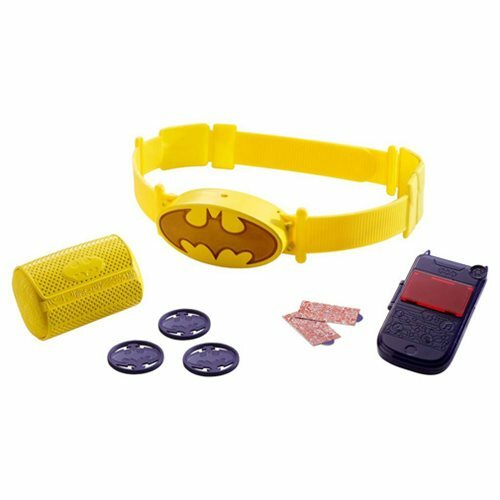 Push the button on the bat symbol belt buckle to activate lights and sound effects for a dynamic Super Hero moment! Fans of the web series will recognize dynamic sounds and signature phrases of this favorite DC Super Hero Girls character. Take the phone out of its compartment on the belt and open to find the secret messages stored inside - then close the phone and use it to decode them. Have more secrets to carry? Use the hidden compartment within the bottom of the belt's removable pouch to stash them away out of any villain's sight! Young super heroes will love finding their own unique abilities along with the students of DC Super Hero High. Learning to master super powers can be super awkward, but the galaxy is the limit! Wearable utility belt features lights and sound effects, a pouch with secret compartment, phone holder with removable phone/decoder and four secret messages. Utility belt symbol measures approximately 4 1/2-inches wide. Requires 3 AG13 (LR44) batteries (Included).